Prior to their rediscovery in 1994, crested geckos were believed to be extinct. Now, they are a popular option for pets, especially amongst beginners. They require minimal care and maintenance, so it is easy to handle even if you are a novice when taking care of a gecko. Even for children, they are safe as a pet, provided that they are handled appropriately. It is also popularly called eyelash gecko, Caledonian crested gecko, or Guichenot’s giant gecko. The latter is derived from the last name of the French zoologist who has discovered this gecko. 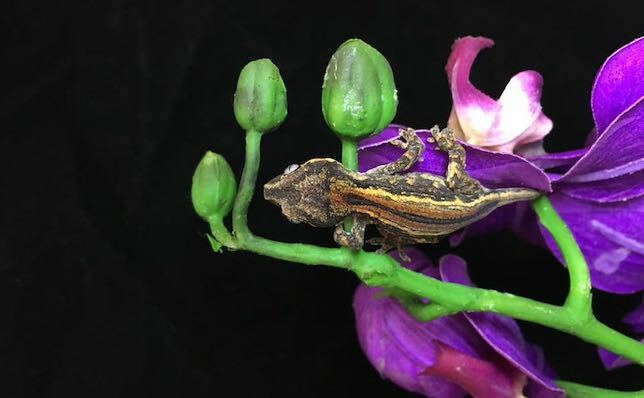 If you want to take care of a crested gecko as a pet, keep on reading the rest of this post and we’ll let you know some important things, including its diet and captive habitat. The average length of the crested gecko is from seven to nine inches, which already includes the tail. Meanwhile, the approximate weight of a male crested gecko is 25 grams when it is an adult. Females are generally heavier, usually weighing 35 to 40 grams. The head is flat and triangular in shape. Meanwhile, the eyes are large. Their eyelids have hair-like projections, which are the extension of their skin. The eyes also have a transparent scale, which will keep it moist. It has rows of soft and spiny scales, also called crests, which run from the top of the eyes all the way to the base of its tail. The color of the crested gecko varies. Most of them will have shades of yellow, orange, grey, brown, blue, and red. They might even change their color throughout the day. One of the most notable from the behaviors of crested geckos is that they move a lot in vertical surfaces. Their toe pads and their tails allow them to show off agile movements. They are also known as good jumpers. They are also usually docile, although they can be aggressive and can bite when they feel that they are disturbed. They can also drop their tails when they attempt to get away from the threat. However, unlike other gecko species, their tails will not regenerate. In the wild, you will often see crested geckos in inland forests, mountains, and coastal lands. They love being in tropical islands since they like environments that are humid and hot. Therefore, if you want to keep them as a pet and take care of them indoors, you should try to recreate such an environment. will be good to have.
. The latter is dimmable, making it easier to control the light and the heat in the enclosure. Fruits and insects make up most of the diet of a crested gecko, both in the wild and in captivity. Crickets and roaches are some of the staples when it comes to their food. If they are too small, they should be gut loaded prior to being fed to the gecko. Pangea and repashy will also be great to be incorporated into their diet. A commercial crested gecko diet will also be well-loved by your pet. Nonetheless, make sure to provide a well-balanced diet by also introducing fruits and vegetables, not just the commercial pelleted foods. Some of the best fruits that they will eat include peaches, bananas, nectarines, papaya, mango, apricot, passion fruit, and pear. Especially when you do not pay attention to the proper care of the crested gecko, it can be easily prone to a number of health problems. Stomatitis or mouth rot is one of the common issues. Some of the most common signs that the crested gecko has this problem include redness in the mouth and excess mucus. If the gecko is wheezing, this can be indicative of a respiratory problem. Rashes can also be common, which could be a sign of a parasitic infection. Crested geckos are solitary creatures. Therefore, they will do best when they are left on their own and not disturbed. You can keep multiple geckos together, but make sure that they do not demonstrate aggressive behavior. To be safe, limit one gecko per tank. At most, keep only one male and one female crested gecko in the same enclosure. A lot of crested geckos may end up losing their tails. To prevent this from happening, you should keep your pet in its own tank and make sure that it is pampered. If you will handle the crested gecko, keep it short and gentle. At most, hold the gecko for only about five minutes.